Our installation teams are second to none, they have all been trained to comply with the company rules. We have a very high standard that we work to, making sure every job is carried out with the up most care and quality, this being the sort of quality, which you would expect if it was being installed in your own home. Unfortunately in our trade, as in many others, there are far to many companies out there that do not consider quality of work, or consideration for the health and safety of your staff at your work place, or your family in your home. The end result being a poorly installed system, which would cause you endless amounts of problems, and eventually a lot of money to repair. That is why all our installations are correctly installed from day one, using the appropriate fixings for all pipes, cables, drains and all other materials needed for the job. To make sure you never have to call us back, to complain about the system not working properly or leaks coming through the ceiling, from badly installed equipment. We also have a team of approvers, which come to your property once the installation has been complete, and go over the installation thoroughly to make sure everything has been carried out correctly by our engineers. If anything isn't to our liking, we get our install engineers to put everything right, straight away with as little fuss as possible. 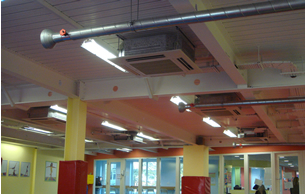 All units that have been installed by us, are covered with a years labour warranty, and three years parts warranty. To arrange for us to visit your property, to design the right air conditioning to suit you, doesn't cost a penny. This is a free service we carry out for all our customers, with no obligation and no hard sale once the design is complete.